Caroline is doing incredibly well. Since there was very little dairy in my own system, she was able to work it out of her system very quickly. We only had three to four rough days, instead of three to four rough weeks. It was definitely worth going on the MSPI diet early! Since I haven't posted a recipe in ages, I thought I would start with something sweet. These are ooey, gooey and oh-so yummy. The recipe comes from Pillsbury. You can make it with a brownie mix, as is done here, or use a favorite brownie recipe of your own. Heat oven to 350 degrees. Prepare brownie mix as directed on package using oil, water and eggs. Cool completely. Spread marshmallow cream over cooled brownies. Place frosting in microwave-safe bowl. Microwave on high 10 to 20 seconds. Stir until smooth. Drizzle frosting over marshmallow cream. Swirl with knife to create marbling effect. Refrigerate 15 minutes. To cut cleanly, lightly coat knife with no-stick cooking spray, as needed. Run knife around inside edge of pan to release. Store loosely covered in refrigerator. Yum! While on the diet, I made these but a little differently. I made the brownies and baked them. Then, while warm, I put mini marshmallows and crumbled graham crackers on top and put it under the broiler for a minute or two (to brown the marshmallows). Then I sprinkled with MSPI-safe chocolate chips. They takes just like smores!!!! I've made that before, too, Kimberly. Brownies are so versatile! Vegetable oil is made from soybeans by the way so this isnt entirely a mspi friendly recipe. Just thought I would let you all know. Anonymous: Soybean oil and lecithin are safe on the traditional MSPI diet. Why? Because they do not contain soy protein, which is the source of intolerance. Yes, some very sensitive kiddos may still have problems with soy oil and lecithin, and they will have to adjust recipes for that. However, the vast majority of traditional MSPI babies are OK with it. I hope that clears things up for you! 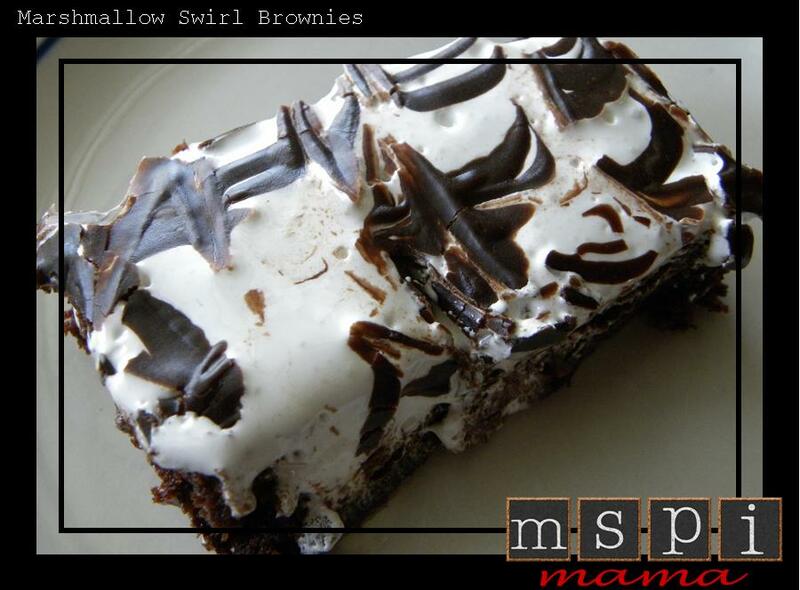 In the recipe you use MSPI friendly brownie mix. I'm fairly new to the whole MSPI thing (my husband has it) so I was wondering what you use. It would be very helpful as he LOVES brownies. Thanks!! Tiffany: I like to use Duncan Hines, but there are others that are OK as well. However, do be aware that cross-contamination is always a possibility when using mixes. So if your kiddo is pretty sensitive, you might want to make brownies from scratch. You could try something like this recipe: http://www.tasteofhome.com/recipes/Fudgy-Brownies-5. Good luck!